MapGuide Open Source is a new web mapping platform that was originally developed by Autodesk and contributed to the Open Source Geospatial Foundation. MapGuide Open Source is a web-based platform that enables users to develop and deploy web mapping applications and geospatial web services. 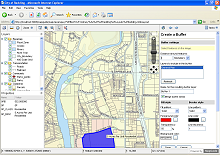 MapGuide Open Source is free, open source software licensed under the LGPL. Diese Seite wurde zuletzt am 8. September 2006 um 17:52 Uhr geändert.